This article originally appeared in The National Interest under the title, "This Economic Trick Will Stabilize Syria." The war in Syria has hit a bit of a lull with the shaky ceasefire largely holding under Turkey's protection in Idlib. The United States and its Arab and Kurdish allies remain in control of the northeast, and Assad's forces—backed by Russia and Iran—have reclaimed the other half of the country. But that doesn't mean they've stopped angling to improve their respective strategic positions and the relative prevailing calm is under constant threat of unraveling. For Bashar al-Assad, Vladimir Putin, and the mullahs in Iran, the diplomatic track has taken the form of trying to attract international reconstruction investment by attempting to convince the world that the war is over and Syria is stable. The political path they are tied to is the Astana process, which is led by Russia and joined by Iran and Turkey—whose participation depends on the ally it feels like squeezing at the moment. The process is designed to paper over reforms and maintain the same power structure with Assad serving as Putin's puppet. Despite a long list of grievances between Ankara and Washington, Turkey simultaneously remains a key partner of both the United States and Russia, which is an untenable position when it comes to Syria's future. However, from Ankara's perspective, America's alliance with the Kurds is the chief stumbling block to a more cohesive partnership. The United States should use its leverage with both of its partners in order to enhance its position with Russia. The way to do so is by working to create an agreement that would economically integrate Syria's northeast or Jazira Region with the northwestern Idlib pocket. 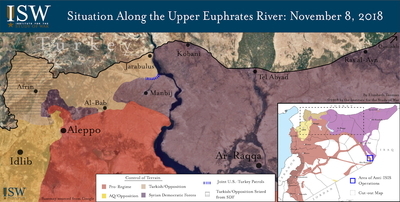 Doing so would once again link the Arabs and Kurds on both sides of the Euphrates River, while excluding the areas Assad controls to the south. The initial focus would be on trade—particularly agricultural resources such as cotton and wheat from the east, and fruit and vegetables from the northwest, most of which is needed for domestic consumption. The United States could bring to bear its considerable leverage in such a negotiation by harnessing Syria's oil and gas resource potential, 95 percent of which is under the control of the United States and its Kurdish and Arab allies in the northeast. Turning a profit from this economic engine requires its refinement and export, but the two refineries in Homs and Baniyas and the three export terminals on the Mediterranean coast remain under Assad's control . The solution is to send it to Turkey, who would make a profit from its refinement and export to Europe. A joint fund could be established and administered by the United States, Turkey, and representatives of the Jazira Region—one that would allow them to prevent the profits from empowering any single sectarian group over the others. In doing so, they could start identifying the Syrian Kurds not aligned with the PKK, the Kurdish militant and political organization based in Turkey that Ankara considers a terrorist group. This economic reintegration, call it the North Syria Economic Cooperative, would simultaneously accomplish multiple objectives. Aside from the obvious benefit to the roughly six million Syrians already living inside the economic zone, it will encourage large numbers of refugees and internally displaced persons to return without fear of Assad's retribution and his so-called "reconciliation agreements." Basic services could be paid for by the jointly administered energy trust, which would also provide much-needed funds for Syria's overall stabilization. This will, in turn, provide a foundation for legitimate business opportunities, which will attract international investment in Syria's reconstruction, untainted by Assad and his new business oligarchs. This effort would set in motion a functioning economic model of cooperation from which new Syrian leaders could emerge and participate in any serious negotiation with the regime. Tethering the plan to the reinvigorated Geneva political process would also signal that the international community will not divide Syria, while sending an unmistakable message to Assad and his backers that a return to business as usual is not an option. The creation of this new socioeconomic pact would also reinforce the notion that the exploitation of resources in the east to fuel the economic activity in Syria's major western cities under Assad's control, will not resume without an irreversible political transition as stipulated in United Nations Security Council Resolution 2254. There are additional benefits for the United States as well. Such a plan would keep Iran financially isolated as it goes to creative lengths to avoid the returning sanctions on its own energy sector. It would also enhance America's leverage over Russia, which will be useful not only in Syria but beyond. Moving Syria forward requires thinking outside the box. Creating a functioning example of socioeconomic integration will allow Syrians to achieve what they've strived for since 2011, namely, dignity, stability, job opportunities, rule of law, a new social contract, and most importantly, the physical and political protection they need to rebuild their own country by themselves. Critically, this can be accomplished without the Trump administration owning Syria but rather, by using its ample leverage and empowering the Syrian people who are ready to pave a pathway to a better future.